During the long Islamic rule in Bengal on the medieval period, the rulers made many magnificent mosques, a big part of which is located in current days Bangladesh. These mosques typically had a big pool annexed with it, which was part of charity work by the state, to facilitate the religious needs and also full-fill the demand of drinking water. As stone was not available in Bengal, these mosques were mostly built with burned clay, ornamented with beautiful terracotta. Bagha Mosque is one of these beautiful mosques in current day’s Bangladesh. Bagha Mosque is a beautiful pre-Mughal period mosque, located in a remote village named “Bagha”, 40 km south-east of Rajshahi. It is known from a inscription stone found in Bagha Mosque complex that it was built in 1523 A.D. by the Sultan of Bengal Nasiruddin Nasrat Shah. He was the son of Ala-ud-din Husain Shah who was an independent late medieval Sultan of Bengal, and founder of the Hussain Shahi dynasty. The inscription stone is currently preserved in a museum at Karachi in Pakistan. Bagha Mosque is 75 feet X 42 feet in length, 24 feet 06 inch in height. It’s walls are 08 feet thick. The whole compound is built in a raised platform, annexed with a big pool. There are two entrance in north and south side to enter the compound. The north entrance is recently built after the renovation. The south entrance is intact and has octagonal pillars with dome shaped top. The mosque has four octagonal corner turrets, which form a part of the building. These turrets are beautifully decorated with terracotta. Top of these turrets are dome shaped, and still exists. There are five pointed-archways in the east side, and two in the north and south side each, to enter the mosque. The archways in north and south walls are closed by gratings. The mosque has 10 dome in total – 05 dome in 02 rows each, supported by four corner turrets and six free standing stone pillars. The roof of Bagha Mosque was collapsed during the great earthquake in 1897 AD. and was carefully restored later in 1980 A.D. by the archaeological department of Bangladesh. In the west wall, the central mihrab is located straight ahead of the central entrance. Two other mihrab is located on the south side of central mihrab, straight ahead of the two southern entrances. Instead of the fourth mihrab on the northern side, there is a beautifully designed panel. The fifth mihrab is small and located on top, which indicates that there was a gallery on this corner, which were normally made for the rulers, higher officials, and their immediate entourage. The whole outer walls of Bagha Mosque is very beautifully decorated with terracotta. A 30 feet X 20 feet size paved in-house pool has been discovered outside the mosque during the excavation work in 1997, which has stairs from three sides. It had a tunnel connected with inside. A Muslim holy man named Shah Doula came to this area in 1505 AD from Baghdad with five companion to spread Islam, who said to be the founder of the area ‘Bagha’. On his fame many people were gathered in this area. There is a shrine of Shah Doula, his five companion, and many unknown people in the northern side of the mosque. Every year a two days fair is organized here during the Eid-al-fitr which is famous as “Bagha Fair”. You’ll see lots of activities here if you visit this mosque on this time. Have you ever visited the Bagha Mosque in Rajshahi? How magnificent have you found it? Have I missed something here? Share your thoughts and experience with us in comments. Any question about visiting Bagha Mosque? Ask us here! Consider sharing it in social media so that more travelers can know about this beautiful country which is little known to everyone. 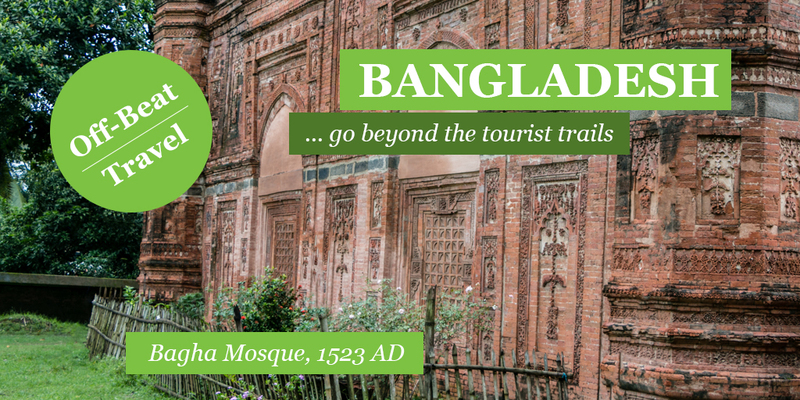 Check out our archaeological tours in Bangladesh to visit the most impressive archaeological sites including Bagha Mosque, and our Bangladesh tour packages and holiday packages in Bangladesh to visit Bangladesh with comfort.